Dorchester plantation shutters by Just Shutters, Dorset’s longest established specialist shutter company. We are the county’s premier shutter company, providing stunning interior shutters in Dorchester and the surrounding areas. Your local shutter expert Gavin McGuiness is on hand to listen and guide you on the finest shutters for your home or business. Call 01305 230321. – Enhancing the security standard of your home. 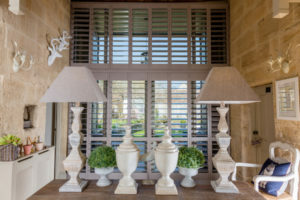 Therefore, it is evident why our rang of shutters is second to none! Browse our photo galleries to explore the different options. Just Shutters are the county’s number one shutter company. Having been established on the sunny Dorset coast, we have now grown to cover 165 towns and cities across the UK. We still are your local experts in Dorchester Plantation Shutters; only with the quality, buying power AND lifetime guarantee of an established brand you can rely upon. Aside from the design statement, style and ambience shutters bring to a room, the beauty isn’t just ‘skin-deep’! The added benefits of shutters make them a perfect lifestyle product you will simply love living with. Shutters are extremely practical, low maintenance and a perfect solution for any window or door. Even those that traditional curtains or blinds simply could not cover! Whether it is a shaped, angled or arched window, a bathroom or kitchen with high humidity, or even a whole conservatory – shutters provide the perfect solution. This is not to say that those more standard windows cannot be elevated into a design feature! Quite the contrary, even an average window can become a masterpiece with our beautiful shutters. Let us not forget that while shutters are looked on by many to be a luxury product and thought to have a price tag to match, many are surprised at the affordability of shutters and the value they provide for years to come. They often enhance the value of a house as they stay with your home should you ever move on. Shutters provide an extra layer of insulation on your windows which can reduce your heating bills. They do not warp or bleach with sunshine or weathering and come with our Just Shutters lifetime guarantee, so while you own the shutters we will support you with them. A bold statement we know, but as the most reviewed shutter company in the area with ratings of 9.9 on Checkatrade, you don’t just have to take our word for it! We strive to ensure that every customer brought into the Just Shutters fold, is treated with the upmost respect and given the best customer service from start to finish. All our staff are experts in the field of Dorchester Plantation Shutters. As a company we specialise in window shutters, not as an add on to other products but as our speciality and passion. Every window we design and every shutter we fit is a long term investment in your home, and our long term investment in our business and reputation. So, from a smiling greeting in our showroom or on the telephone, to removing our shoes when we come to fit in your home, we will make sure those little details will leave a great feeling when you think of your experience with our company. We would be delighted to speak to you in person on 01305 230321 and answer any questions you may have. Alternatively please follow the links below and enjoy seeing what we can do for your home.